Eyelet buttonhole machine. Adjustable flybar, cut before or cut after, regular travel, regular eye. Pattern cam replacement allows rapid changes in buttonhole styles (size, eye style, end finishing (open end, flybar or crossbar)). APPLICABLE: For tailored clothing, outerwear, vests and jeans. ♦ Max. sewing speed - 1700 rpm . ♦ Max. buttonhole length 10-32 mm. Eyelet buttonhole machine. Adjustments of buttonhole types, shapes and cutting selection using levers, knobs. APPLICABLE: For tailored clothing, outerwear, vests, workwear and jeans. ♦ Max. sewing speed - 1600 rpm . ♦ Max. buttonhole length 13-32 mm. 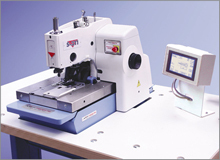 Advanced fully programmable eyelet buttonhole machine with pneumatic system. APPLICABLE: For all types of garments from light- to heavy-wieght materials including denim and leather. ♦ Max. buttonhole length 16-32 mm. 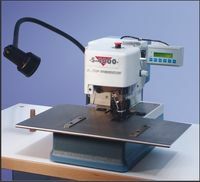 High speed, electronic, chainstitch, imitation sleeve, buttonhole machine with pneumatic system, with Indexer. APPLICABLE: For sewing decorative non-functional buttonholes on jacket sleeves. ♦ Max. 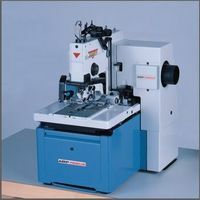 sewing speed - 3800 rpm . ♦ Max. buttonhole length 16-25 mm.